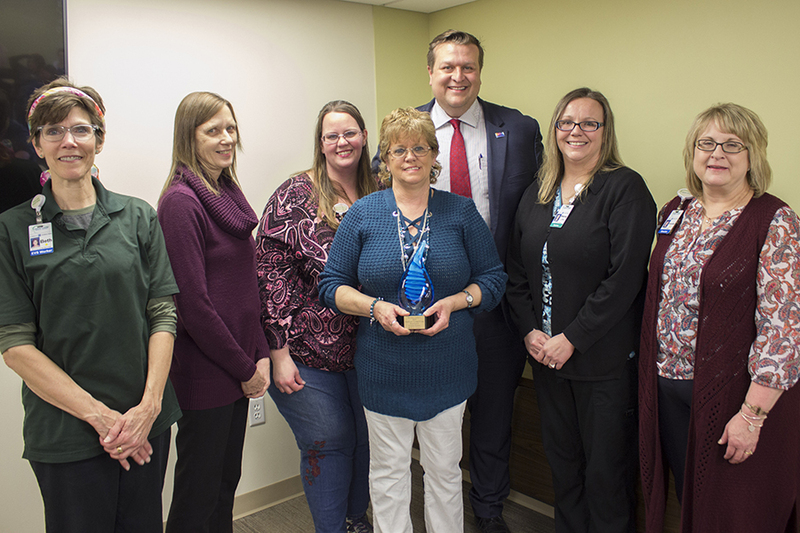 At Greene County Medical Center’s employee recognition celebration on March 27, Dar Zollars was given the 2018 Employee Exemplifying Excellence award. The recognition celebration honored six Employee Exemplifying Excellence nominees, as well as 21 employees with milestone work anniversaries. Overall, there were six nominees for the Employee Exemplifying Excellence award: Stacey Biggart, Long Term Care; Beth DeMoss, Environmental Services; April Kniffin, Nutrition Services; Dannelle McDowell, Materials Management; Deb Schoon, Long Term Care; Dar Zollars, Environmental Services. 2018 Employee Exemplifying Excellence nominees with CEO Carl Behne, left to right: Beth DeMoss, Deb Schoon, April Kniffin, Dar Zollars, Stacey Biggart and Dannelle McDowell.